Bacon is what started me on the homemade path and it keeps me there. This past winter a local shop had pork bellies for $0.69 per pound so I picked up ten whole bellies and cut them into five pound pieces, wrapping them nicely and filling the bottom half of my freezer. 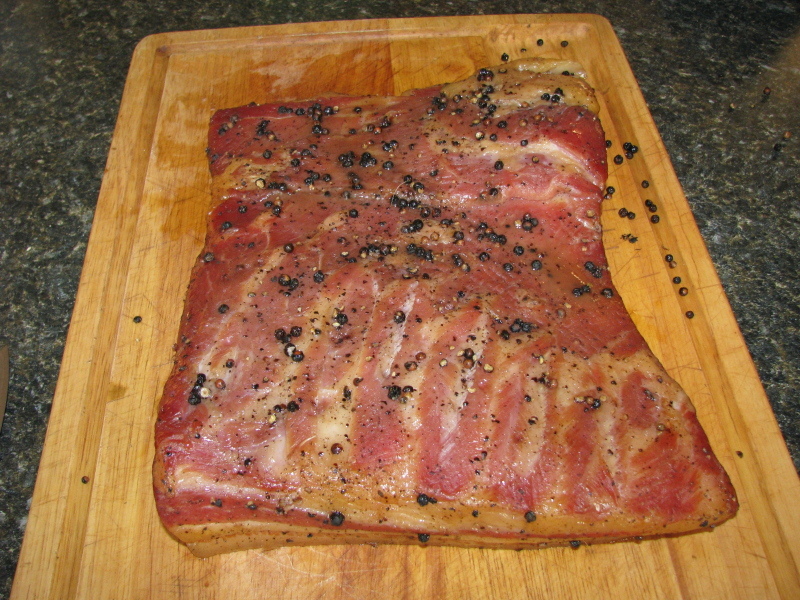 Every few weeks I pull a piece of belly out and make a good breakfast bacon. 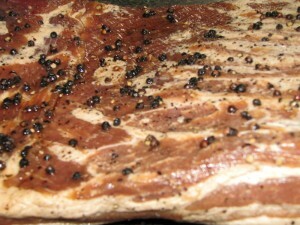 I say breakfast bacon because I like dark brown sugar and maple syrup in the cure, along with salt, pink salt and pepper. Pink salt is the uncommon ingredient in that list, but it’s sodium nitrite mixed with salt and coloured pink, as a requirement of the FDA. Traditionally curing used saltpeter but we’re refined the process these last hundred years. I order pink salt from the U.S. mostly because the cookbooks and recipes I use call for it. In Canada there are curing products available at my local supermarket: they contain salt and sodium nitrite but say things like “use contents for 200 pounds of meat”. Bacon is a very simple curing procedure and a good start for most people. Most recipes call to rinse off the cure in step 3 but for the sweet breakfast bacon I don’t bother. I use my Big Green Egg for the smoking, skin side down to take the heat and not char the belly. The Egg is great for this, as it keeps a fire going for hours and can maintain a low temperature. I like cherry or apple wood for this bacon and like to keep the smoke going for at least the first two hours. When it’s done I take it off, make a small slice under the skin on one corner and use tongs to pull the whole skin off. Do this while the belly is still hot as it leaves all the fat where it should be and the skin comes off clean. I tried this once after the belly had cooled and did a whole lot of cutting, wasting a ton of great pork fat.